Slept very well, no coughing or sneezing. Wonderful to be wearing clean clothes, especially clean socks! Just leaving and it started to sprinkle so I put the poncho on. Fortunately it was very light and soon petered out. Once again solo on the camino, no visible pilgrams in front or behind. Along the road through flat fields to Sahagún. Upon starting to walk nose immeditely began to drip incessantly, so when I got to Sahagún I asked for a pharmacy to buy a decongestant. I was worried about getting what I wanted, but it there was an American couple, Gary and Elyn in the pharmacy when I entered. 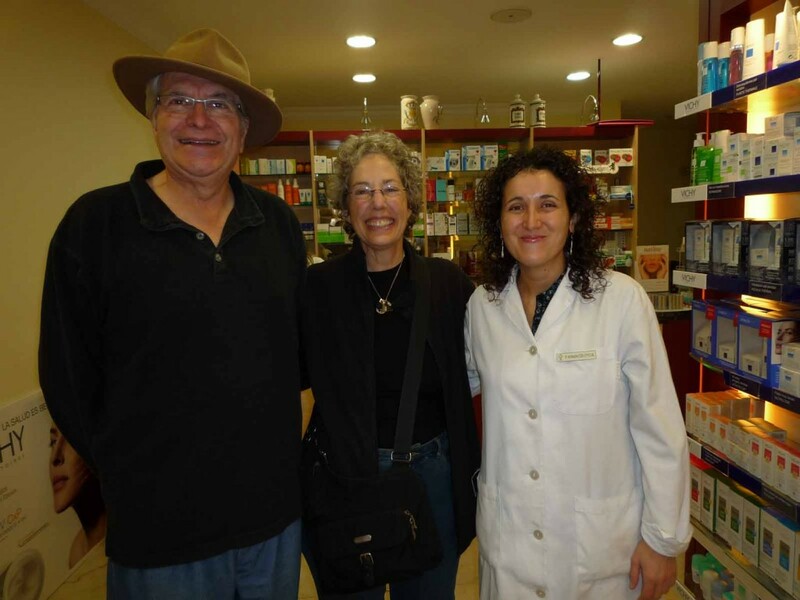 They have retired to Sahagún, and live directly above the pharmacy. They were able to help me get the decongestant (practically instant relief). The Saturday market was setting up, so I bought a pepper, some lettuce, bananas and cheese, thinking I would stop along the way for a picnic as the way today promised to be through villageless farmland. Gary and Elyn were out taking pictures for their grandson for a school project and I kept bumping into them. They have done the camino, and Gary is keeping a blog at havingfununtilidie.blogspot.com that I’ll check out when I get home. Meeting them somehow lightened my mood, I have been feeling a bit alone as so many pilgrims I know are no longer here. Again from Sahagún no pilgrims. Only one man on a tracter. It was lovely, first farmhouses, and then fields, with tractors tilling the soil. Absolutly flat. Just as there were a series of low hills the sun broke through the morning mist. Walked on a well maintained dirt road, with a brushy oak forest on one side and on the other side fields. In spite of pack felt light and free. Before I knew it I was at Calzadilla de los Hermanillos. Stopped as the next albergue is another 18k. And there, sitting in the courtyard of the first café was Sieglinde! Now accompanied by a younger woman, Pia, also from Germany who speaks English and Spanish. I last saw Sieglinde just outside Belarado, through I heard she was in Carrión when I was there I did not see her (because she was seen waiting to take the bus). I went to the albergue and while signing in was further delighted to see that Nando and Eduardo were here just last night and Beate was here the day before. I was glad because I think all three would have really enjoyed today’s walk (this is an alternative route). And I was comforted by knowing approximately where they are. Saw from the book that there were only 3 pilgrams here the night Beata was here and only 7 last night, but to night it is full, mostly Germans, but also Vladka & Richard the czech couple, Oliver and Tracy the Australian couple and Brian and Lauren from Kansas. Went back to sit at the café with Sieglinde and Pia, to catch up. Her eye and forehead, purple when I last saw her are practically normal. Nice dinner (quail) with Seiglinde, Pia and the austrailians. We ate in the smaller dining room as the large dining room was stuffed to the gills with a wedding party. We had watched this afternoon as they cooked the meal for 30 people or so in a tiny, closet sized kitchen. Quail-dinner, does it go confirm to pilgram-Charakter?? And, wow, Sieglinde is back! Nobody gets lost. silk nightgown, drinking a tea. have a coffee (no tea) and think of you! Hey Jeanne, it was good to meet you in Sahagún yesterday. I’m glad you are doing well on the next leg of the journey. Also glad you have found friends again. Certainly good that the decongestant helped. Somehow, walking with a drippy nose doesn’t sound like a great adventure! Déjà une semaine au travail mais mon coeur est toujours sur le Camino… J’ai acheté des figues au super marché(!!! )j’écoute de la musique espagnole, Brésilienne, Américaine, Colombienne, j’étudie ma géographie mondiale, j’ai affiché la carte d’Espagne dans ma cuisine et je suis ton chemin étape après étape… je prolonge ainsi la douceur du voyage et je reste avec vous. Already a week at work but my heart is always on the Camino … I bought some figs in the super market (!!!) I listen to Spanish music, Brazilian, American, Colombian, I am studying world geography, I posted the map of Spain in my kitchen and I am your way step by step … I prolongs the mild trip and I stay with you.